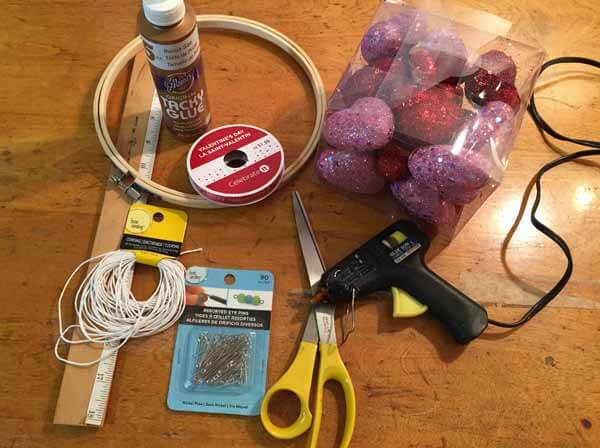 Time for DIY Valentine's Day crafts. 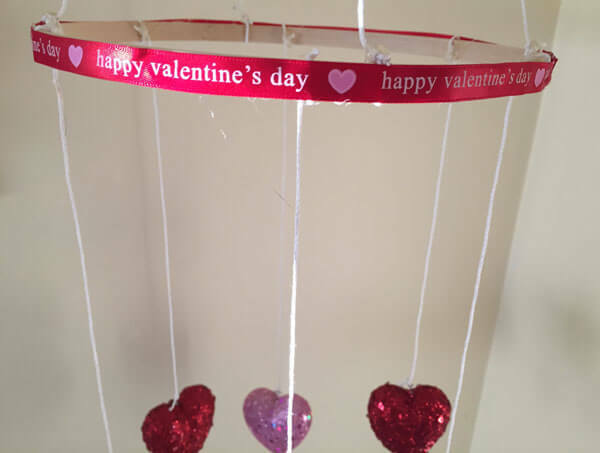 If you have kids or grandkids, they will enjoy making this easy Valentine's Day Heart Mobile. 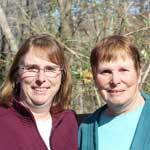 Imagine how delighted they will be seeing in hanging in their home. 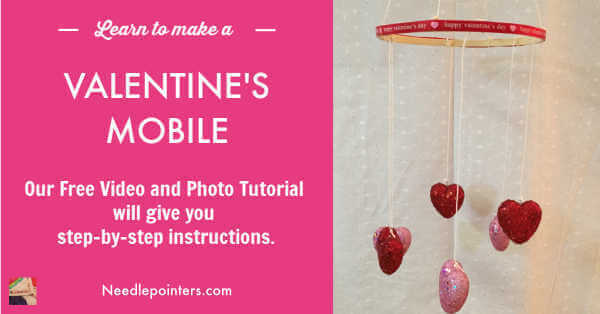 Watch this video tutorial and read on to see how to make this mobile. 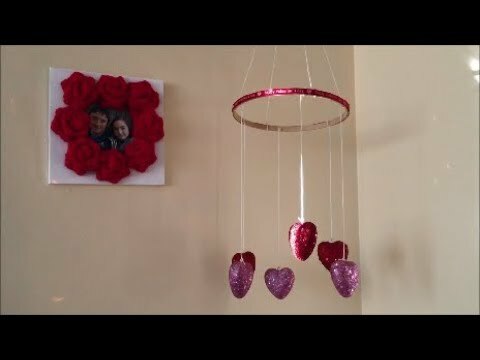 Click to watch the Valentine's Day Heart Mobile video in Youtube. For this mobile, I use 6 hearts. You can use more or less if you wish. 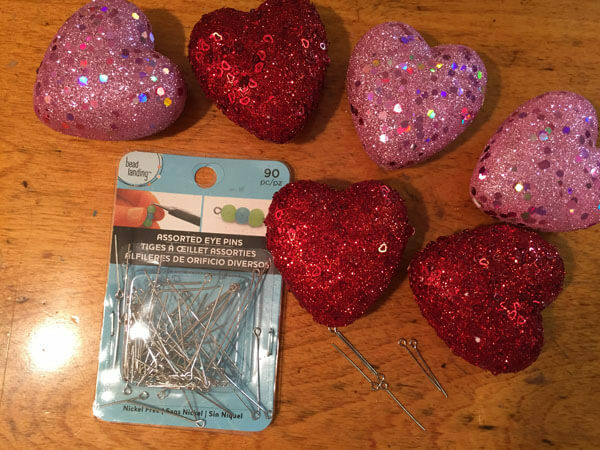 Dip the pin of the eye pin in craft glue and insert the pin into the top of the each heart. 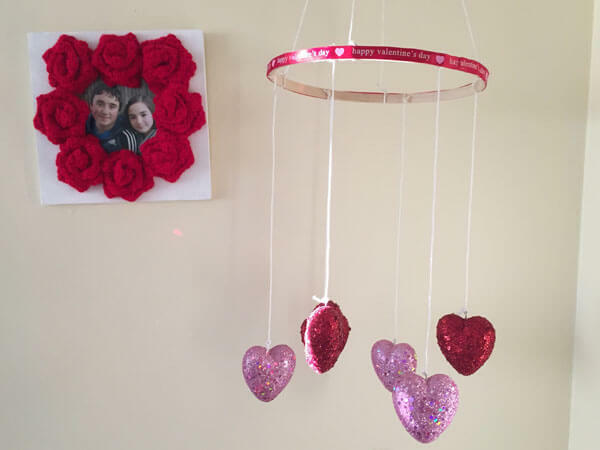 To hang the hearts from the embroidery hoop, I used hemp cording. However, you could use yarn, twine or another type of string. Cut 3 pieces of cording 12” long and 3 pieces 14” long. 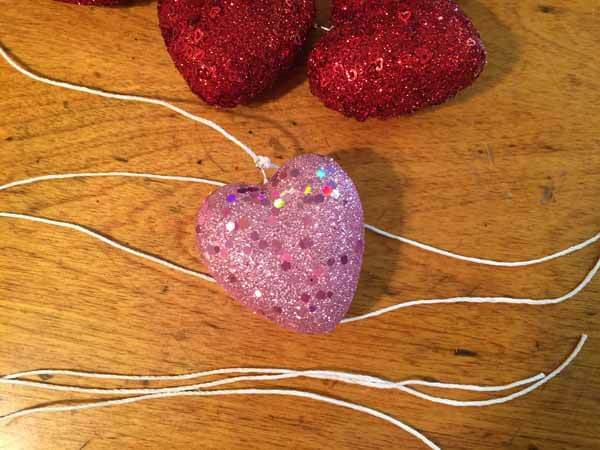 Attach one end of the cording to a heart though the eye pin. Tie a knot. 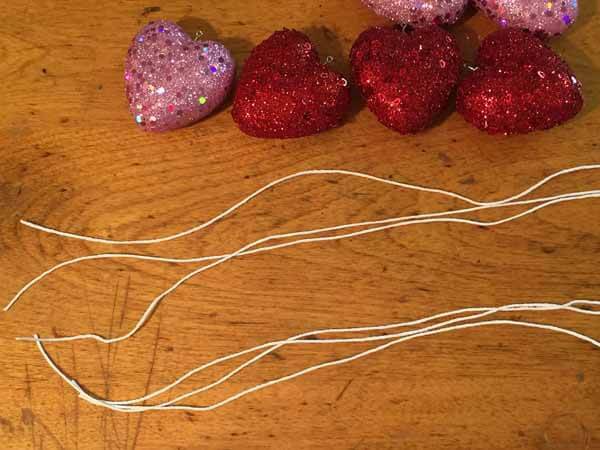 Continue attaching string to all the hearts. Discard the outer ring of the embroidery hoop. This can be used for another craft. 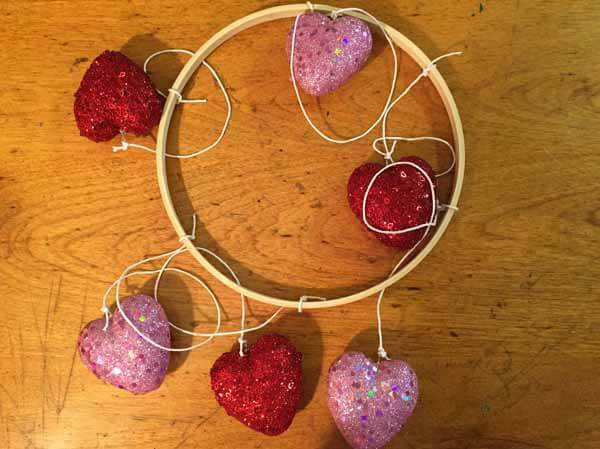 Tie each heart around the hoop equally spaced, alternating a long one and then a short one. 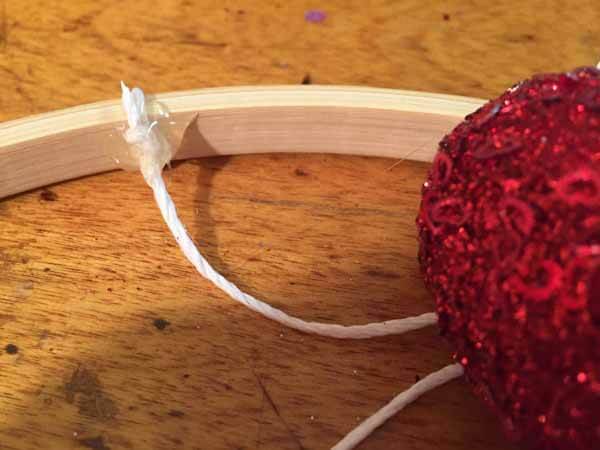 If you want to make sure the knots are more secure and will not come loose, hot glue them to the inside of the hoop. To make the hanger for the mobile, cut two 24” lengths of cord and tie them to the hoop spacing them equally into fourths. At the top, tie an overhand knot in the center of the cords. Hot glue ribbon around the hoop. Viola! The Valentine's Day mobile is complete. It will look so festive hanging in the home. IMPORTANT NOTE: When child are making crafts with hot glue, please have adult supervision. 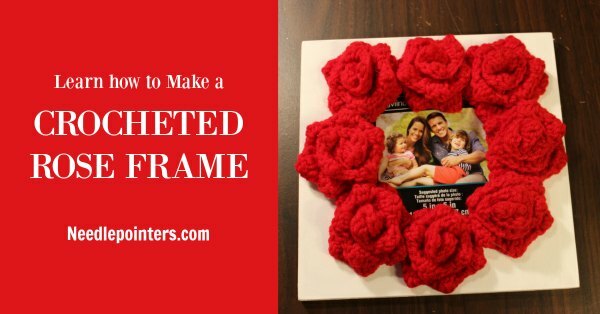 If you would like to make the rose frame as seen in the above photo, click the image below. Eye pins are designed with a loop already at one end, eliminating the need to create one of the loops. This allows the bead to act as a connector to the other elements in the piece. Create lovely bracelets, necklaces, dreamcatchers, mobiles, coiled baskets, decorative balls and more with this classic, easy-to-tie and knot cord. Hemp cord is easy to work with and cuts readily with scissors to desired length. 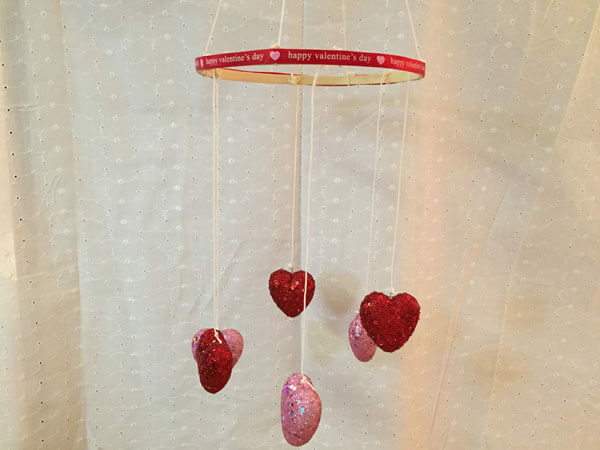 Embellish your table or mantel or make a mobile with these charming hearts by Ashland. 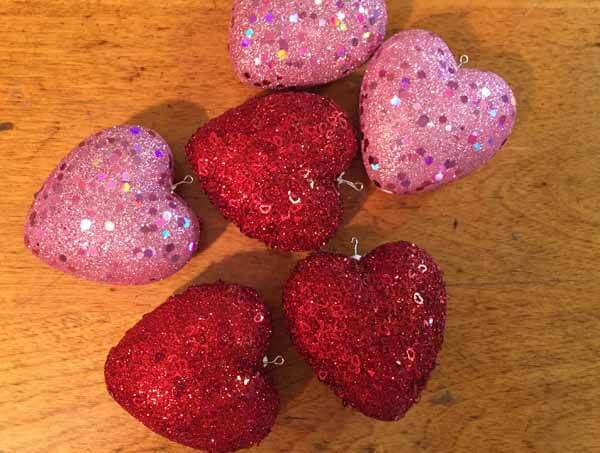 You can scatter these glittering hearts on your table and combine it with some flowers, ornament balls, stems and other decor elements for a stunning display.